The car was unveiled at an event in Los Angeles. 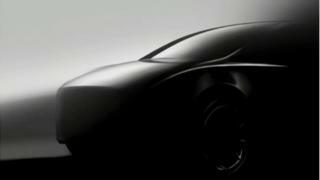 The firm will first release a long-range version of the vehicle with a price tag of $47,000 (£35,489). Chief executive Elon Musk said a standard-range model priced at $39,000 would be available in 2021. It comes after a challenging period for Tesla, with production issues and legal problems for Mr Musk. The Tesla boss had previously described the Model Y as part of a plan to reach a wider audience, following on from the Model 3 – the cheapest car in its range, which was launched in 2017. The first, more expensive Model Y will have a range of 300 miles (482 km). Deliveries are expected to begin in next year. The standard model will have a range of 230 miles per charge. By contrast, the Model 3 has a range of 220 miles, a top speed of 130mph and 0-60mph acceleration of 5.6 seconds. More than 400,000 signed up for the car but it faced production issues and the prices were higher than expected, averaging $50,000. The price was reduced to $35,000 in March. The Model Y will have many of the same features as the Model 3 but will be about 10% bigger. The Model Z – the Y’s more expensive sibling – has a starting price of $79,500. It hasn’t been an easy few years for Tesla. Production issues have plagued it, and 2018 proved a highly controversial year for chief executive Elon Musk. A tweet about taking Tesla private led to him being sued by the Securities and Exchange Commission, and he also faced a defamation claim over a tweet. This year did not start on a much better footing. In January, the firm announced it was cutting about 3,000 jobs, with Mr Musk describing the previous year as the most challenging in the firm’s history and acknowledging that the cars were still “too expensive for most people”. Tesla announced it would shut down a substantial number of its stores, but later changed its mind and said it would raise the prices of its cars – but not the Model 3 – instead.